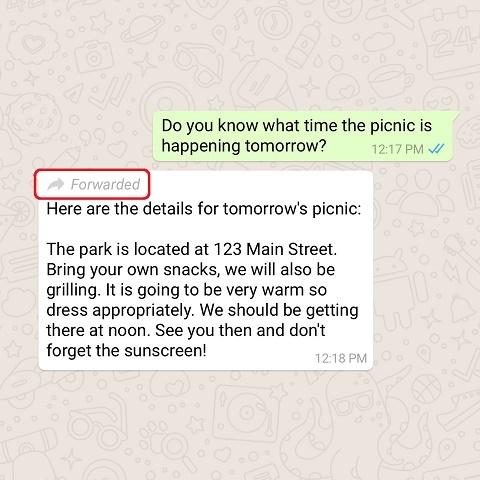 In a recent official blog post by WhatsApp, on 10-06-2018, it have introduced a new feature on WhatsApp, the most popular messaging application on the world. Now this feature will label forwarded WhatsApp messages as "Forwarded". So with this feature one can easily identify if any messege actually originate from your friend or he/she have just forwarded it, may be without verifying its "Real or Spam". 1. Too cheap deals. If you come across some deal sharing random web page, which tells you to share some msg to your WhatsApp groups, to get a very costly thing for free or at a cheap price. This might be scam. Further if you input your bank or card details or any kind of personal information, you might be in a messy fraud situation. 2. Messages showing violence on Gender, Caste, Religion etc. These msgs might not be true at all. These are may be planned to ignite a social, political regional tensions, and may harm some innocent people's lives. 3. Viral msgs with emotional content asking for sharing, or asking some kind of donation. Before acting something on these kind of msgs, we are politely asking you to please verify the content. "As a reminder, you can report spam or block a contact in one tap and can always reach out to WhatsApp directly for help. Be safe, stay alert."